Over the past decade, residential development in Chester County has been gravitating toward multifamily and attached units versus single-family detached homes – a trend that continued last year. To put that in perspective, there were over 2,400 multifamily and attached units proposed in 2017 versus about 700 single-family detached homes. Since 2005, the number of proposed multifamily and attached residential lots/units—twin homes, apartments, and townhouses—in Chester County has exceeded the number of proposed single-family detached residential lots each year, according to Paul Farkas, a senior review planner at the Chester County Planning Commission. The majority of proposed multifamily and attached units have been apartments since 2011. While the proposed development activity in Chester County in 2017 was slightly less than what was proposed in 2016, the annual levels of development activity in Chester County has been steady since the end of the Great Recession, according to Farkas. However, the annual levels of proposed development activity in the county during the last five years are nowhere near the annual levels of proposed development activity from 1996-2006. Approximately 93 percent of all proposed residential lots/units in 2017 were located within a growth area designation of Landscapes2 (the county’s current comprehensive plan), the third year in a row that this figure exceeded 90 percent. Many of the multifamily apartment and townhouse proposals are located in older towns in Chester County, such as Phoenixville, West Chester and Downingtown, and growth centers including East Whiteland, West Whiteland, Uwchlan, Upper Uwchlan, Tredyffrin, and Kennett townships. “We were pleased to see the continued trend of major developments being proposed in areas with existing infrastructure and designated for growth,” said Carol Stauffer, director of the Planning Commission’s Infrastructure and Plan Review Division. The 10 largest official plan submissions in 2017 proposed more than 150 multifamily residential units each or more than 400,000 square feet of non-residential structural square footage per development, according to Farkas. 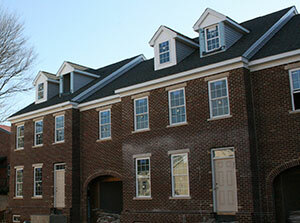 Check out a graphic of Chester County development trends.